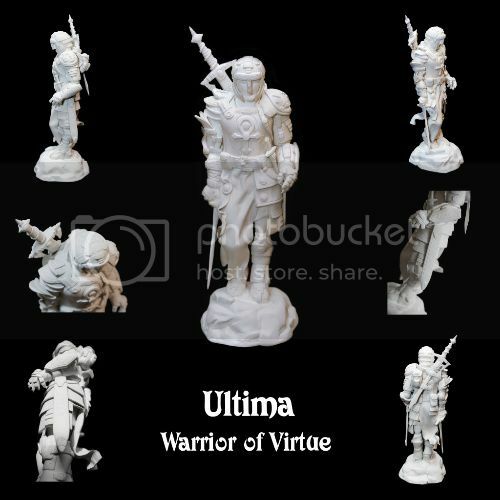 Hello fellow RPG fans, this is a sculpt I created of the Avatar from the greatest RPG series ever, Ultima. The statue is about 12" Tall and is made from Apoxy Sculpt. I would love to hear what everyone thinks, please leave comments here or on my deviant art page http://xar8.deviantart.com/#/d4o3tdm Thank You. I saw the post of this on Ultima Aiera a little over a month ago. Has any progress been made as far as selling these yet? You'd have at least one buyer here. I've found a few of companies willing to make a mold for me and cast reproductions of the statue in both white epoxy and cold cast bronze. I am trying to get a price I can afford and I want to make sure enough people are interested before I take the plunge. So comment folks if you are interested :) I will make sure and update everyone when I make a decision. Thanks for your post.